Well after a loooonnngg break, I’m back at blogging. I hope your summer has been going along well, mine has been busy, as per usual with projects, cottage company and gardening. But of course, come January I will be wishing for that summer busyness. 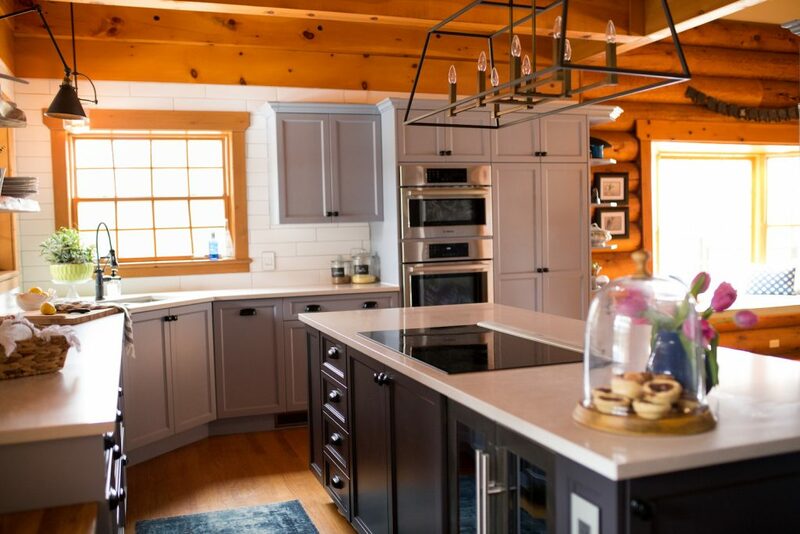 In today’s post I’m sharing my log cottage kitchen which we recently renovated. 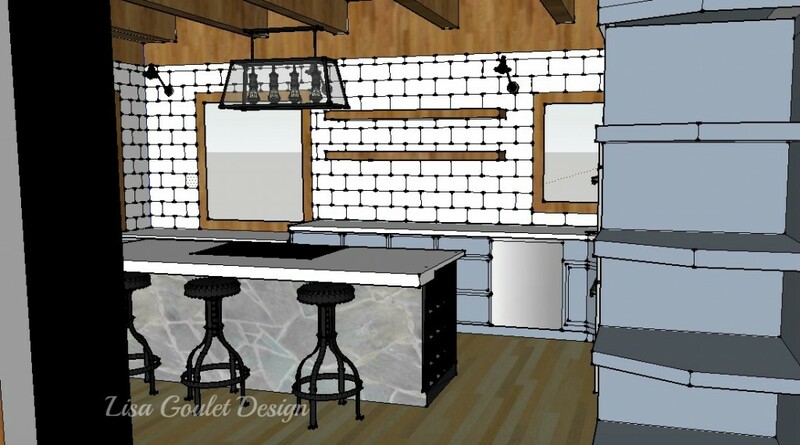 This post will showcase my steals and splurges on this kitchen reno. 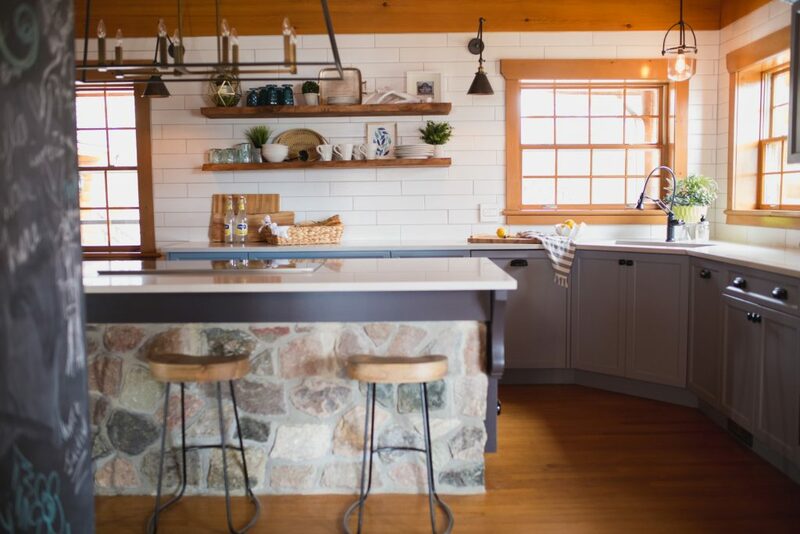 So sit back, grab a coffee or tea and follow along on my log cottage kitchen reno adventure. Huh, maybe renoventure….it really should be a word. So this kitchen started looking like this. the wood window shutters, more wood?? So there were definitely lots of places where we could save money. 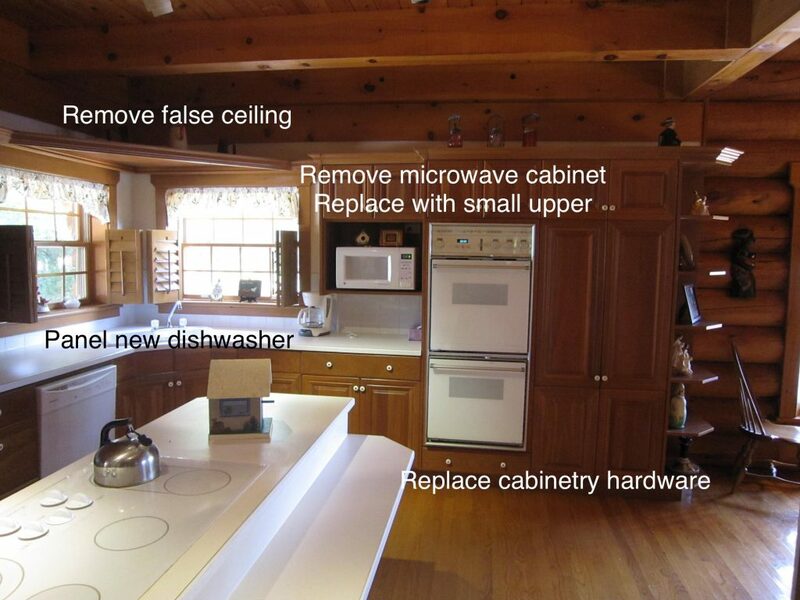 Originally I wanted to keep the cabinet fronts and just have a few made to match and then paint the entire kitchen. However, once I took the cherry fronts to a few companies for an estimate on refinishing, they gave me the bad news that the finish on them was in such bad shape that they would have to be stripped bare. Which was going to be approximately $100 per door, not including the cost of spray painting them. 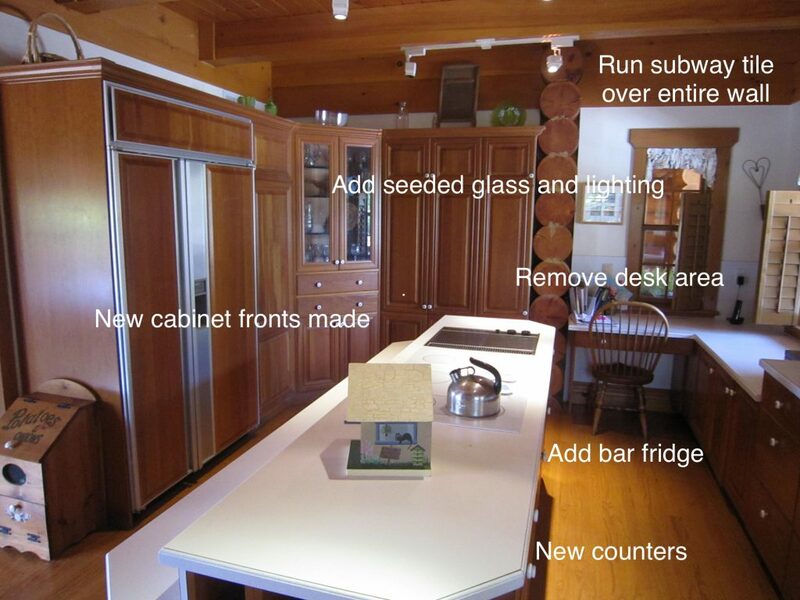 So…onto Plan B – all new cabinet fronts. I can’t say it was inexpensive as it was a custom job but I am thrilled with the results. The plan on computer via Sketchup. I love that it actually came out really close to my original plans. The decision for a blue/grey colour for the cabinets was made shortly after we moved in and it was still my top choice. With all the orange of the wood, the cool tones of the blue/grey are a soothing visual relief. 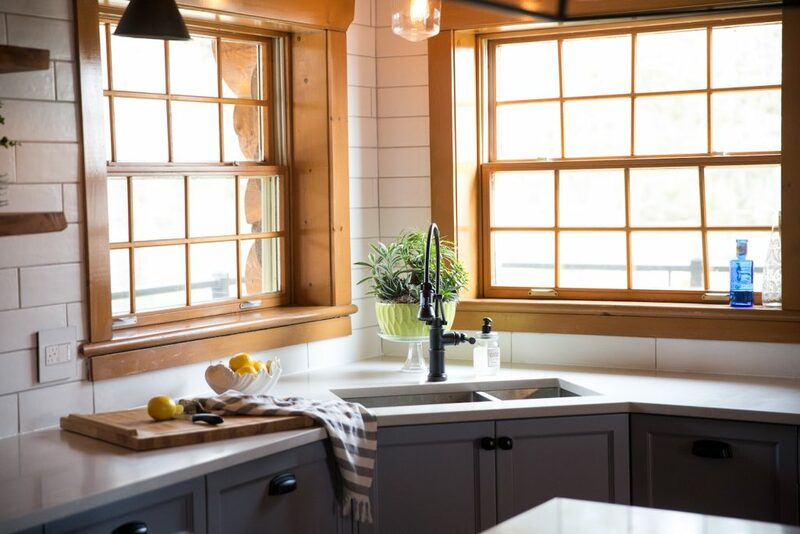 It complements the wood and allows the remaining wood in the kitchen to sing. 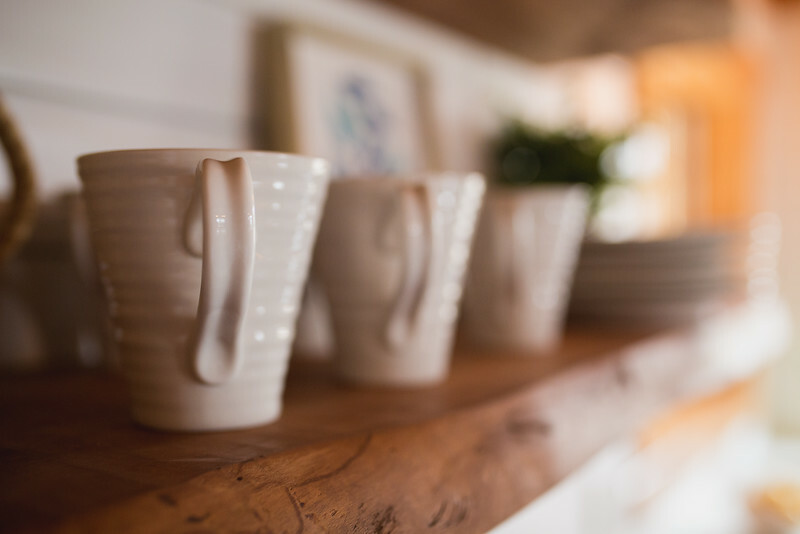 No one used to notice the log ends by the pantries before but now everyone points them out. Once we had a good look at the cabinetry we realized that all the lower drawer cabinets were sagging so we made the decision to have all new lower cabinetry made. We also removed the desk under the window. Due to the lower windows in this area, I decided to have cabinetry made to look more like a piece of furniture here. The two large cabinets house all my big platters, bowls and serving dishes and the open shelving offers some display area. I had been going back and forth on whether to use butcher block here or continue with the quartz countertop. However, once the quartz fabricator did his measurements we were looking at having to purchase two slabs to cover the entire kitchen. So the butcher block was the perfect way to keep the budget in check and since they were from Ikea they were a steal. 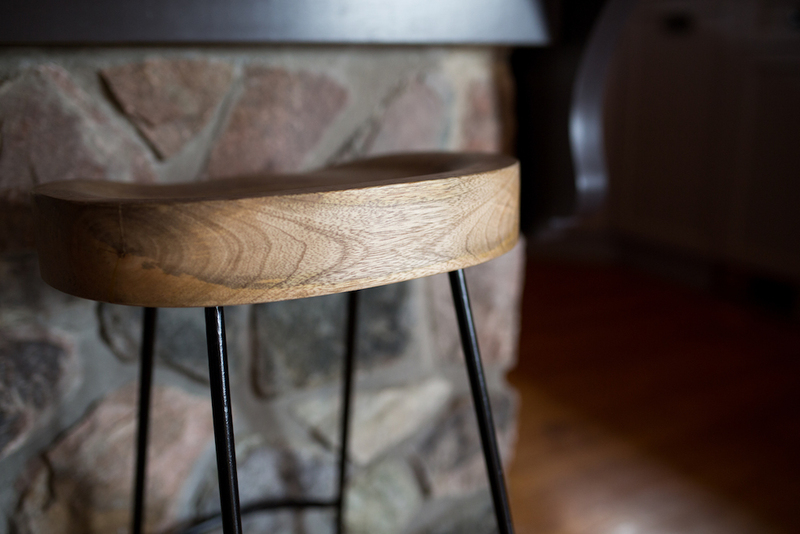 Plus they are a great match to the existing wood. The existing china cabinet was refaced and I had new seeded glass installed that looks like water droplets, so pretty! I also had new lighting installed so it can be lit for entertaining. The center upper cabinetry was all removed and I added in one small upper cabinet where the existing microwave cabinet had been. This was specifically for glasses and mugs as I knew this would be the tea/coffee area. Black cabinetry hardware was added with square knobs on the cupboards and cup pulls on the drawers. The rest of the cabinetry boxes stayed and just fronts were made for them. I also had the dishwasher and fridge panelled to match. This was a splurge but I DO NOT regret a penny of it. In fact this is my hubby’s favourite thing in the kitchen. I also wanted to keep the stone island as there is a matching fireplace and exterior garden walls. This stone is local and comes from a closed iron ore mine that my father-in-law used to work at. So there’s sentimental and practical reasons for keeping the stone. My husband wanted the kitchen to have two colours so I was happy to accommodate this by painting the island in a soft black, which was pulled from the stone colour. 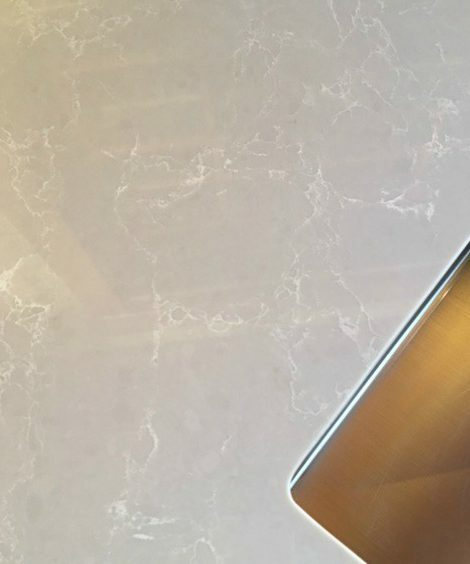 However, once the new induction cooktop and downdraft fan were bought we realized that the existing island was about 2-3″ short in depth to accommodate them. My carpenter was a genius in managing to keep the stone front of the island, by propping it up while the rest of the entirely new island was built around it. The fun with the island didn’t stop there. 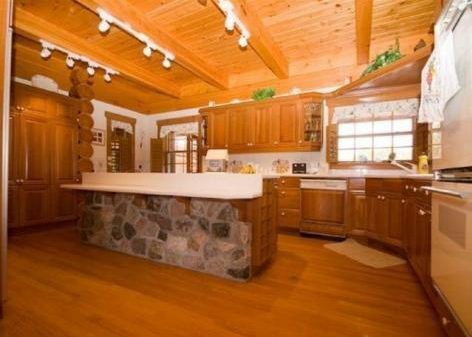 Because of the drop down breakfast bar the stone was too short for the now one level island. This shortfall was fixed by having a piece of wood cut to fit and painted the same black/grey as the island. And then of course there were the holes left when the existing supports were removed. My husband, was the hero at this point when he found stone that would fit and fixed all the gaps. Lastly, custom corner corbels were added to each end of the island. Open wine storage was added back on one end and a beer/wine fridge now installed in the island, holds even more. About 6″ of unused space at the far end of the island became a cupboard with narrow shelves perfect for holding cat food supplies. An electrical outlet was also added on the far end of the island for convenience. 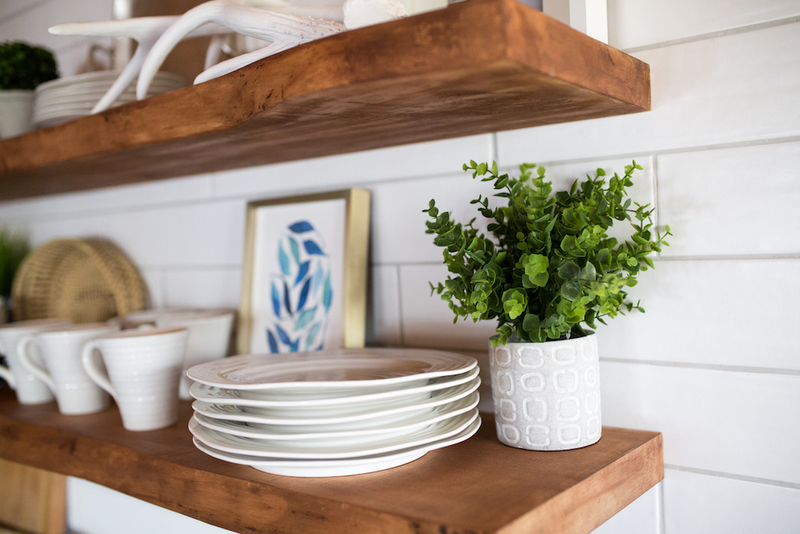 The live edge wood shelving was a real labour of love. I knew I wanted them to be floating with no visual means of support and that took some doing. We purchased the shelving rough from a supplier and had them cut to size. I spent many, many hours taking off the bark and sanding them down. Then my husband went to a welder to have custom supports made that were then drilled into the log walls to ensure they would be completely stable. Then the shelves themselves had to be drilled to match the metal support dowels. We were thankful that we found all these amazing labourers in our little town. Once up we both loved them and they were definitely worth all the effort. Now they house all our everyday dishes and a few special pieces that I rotate once in a while, when I tire of the view. 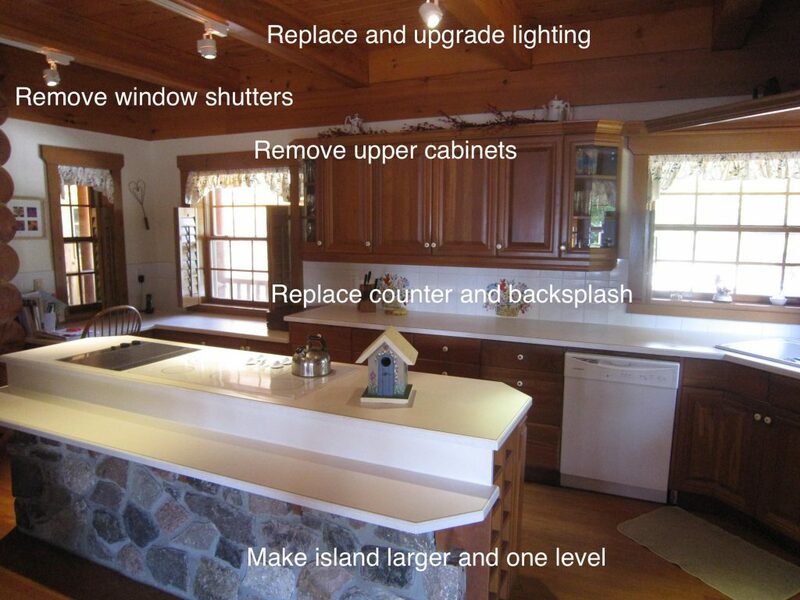 As I mentioned above I used quartz for the main counters and butcher block for the lower cabinet by the window. 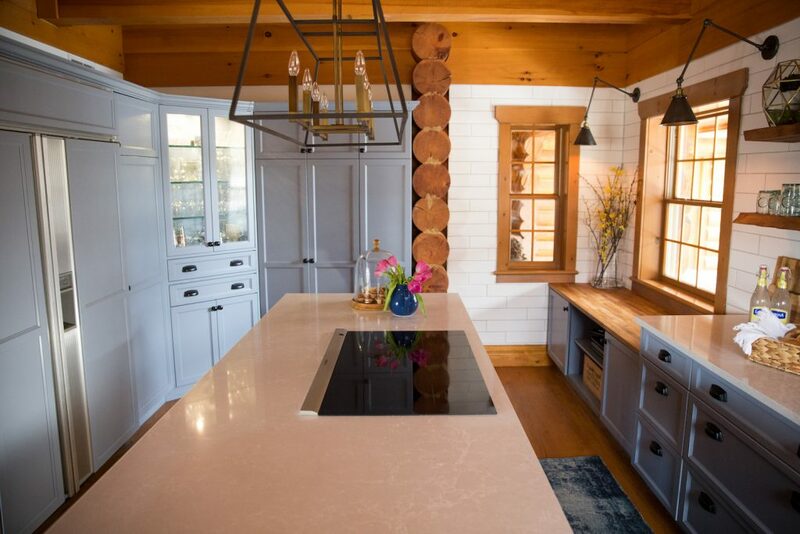 I am still in love with these quartz counters. They have a casual, natural feel and the slight veining in them helps to disguise any dirt. For the sink I originally wanted a farmhouse sink but it wouldn’t work with the angled corner of my kitchen without moving the dishwasher and since I was trying to keep the costs low, I went with Plan B again. A stainless steel, rounded square sink. I went back and forth on either a double, single or one and a half sink. I ended up selecting the one and a half sink. Since the area wasn’t too big, a double sink would have meant two tiny sinks. So the convenience of having two sinks won out. 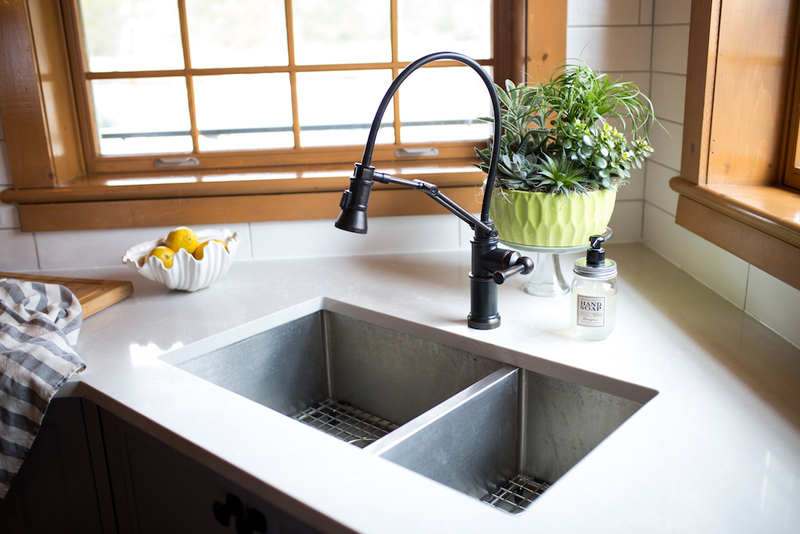 The Artesso articulating faucet was generously donated by Brizo in exchange for my blogging about it. I loved this faucet and planned alot of things around it. I knew I wanted a dark finish to contrast with the light cabinetry and counters. She’s a beauty and I absolutely enjoy her every day. I also wanted dark finishes on my lighting but I love the look of mixed metals. So I went with dark finishes but with little hints of bronze. 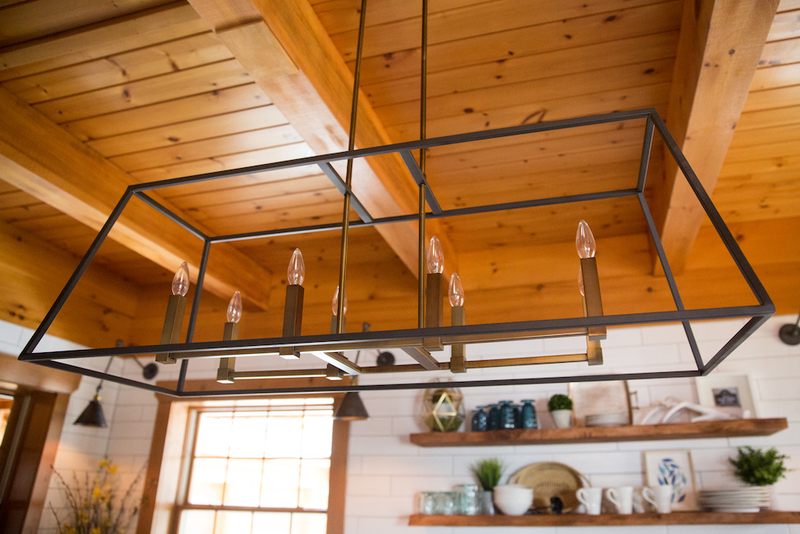 As you can see in this picture above the large pendant has a dark grey and bronze finish. The articulating sconces are also a dark finish but with bronze necks. 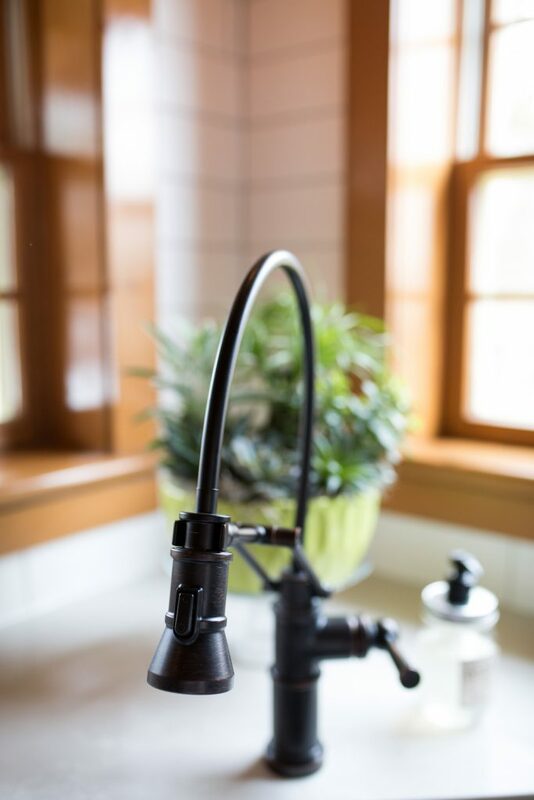 The sink pendant also has a dark finish but with clear glass. The wall you can just see on the left I made into a chalkboard. It’s a fun place for everyone to put messages. I kept the backsplash neutral and clean, since there were enough finishes and textures going on. 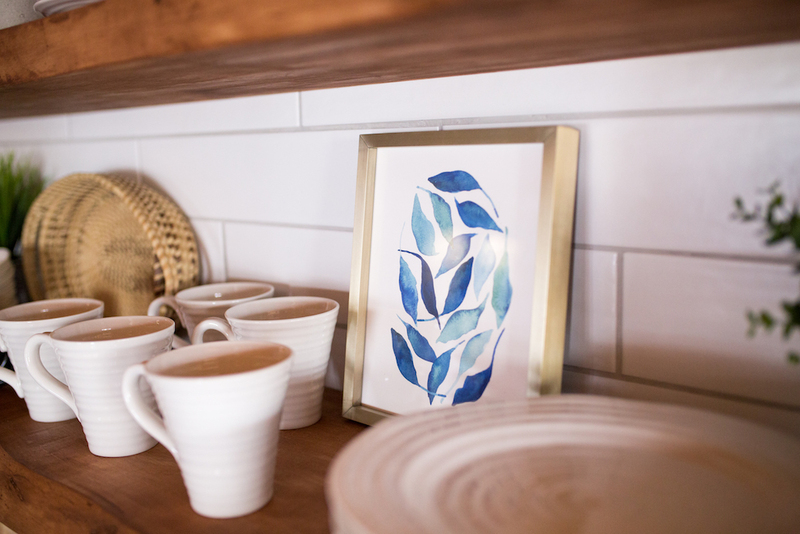 So even, though I love a fun cement tile, I kept it simple. This large scale subway matte tile has a handmade look and with the soft grey grout it is pretty timeless. It covers the entire back and side walls of the kitchen. We painted the walls above the cabinetry the same colour white as the tiles to keep the flow. This was not quite a complete gut but it was certainly transformative. Most people who had seen the kitchen previously, think we have enlarged the space. It just goes to show how light and brightness can make such a difference your home. 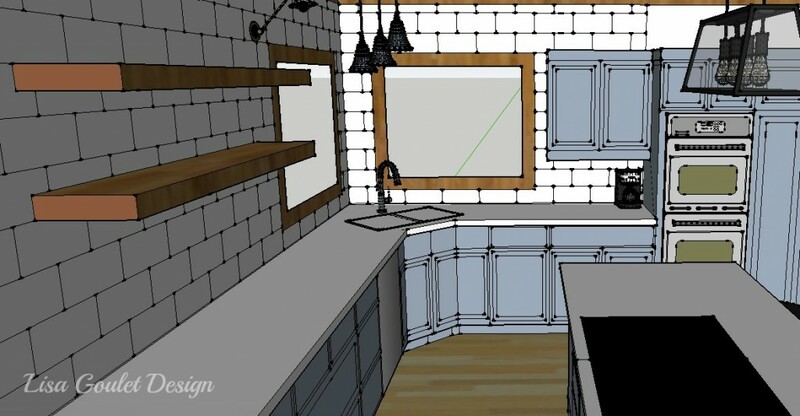 Now, how can we transform your kitchen?